Last edited by inlovewithavdubengine; 07-05-2014 at 10:34 PM. Break the fuel line on the output side of the main pump. Place a long rubber hose on the pump to a big sealed bucket, or one that you can seal... I use the 5 gallon lard buckets from home depot. Jumper the fuel pump relay so that it will run the pumps continuous. WALLAH..... If you hear your fuel pumps whine, then power it off for about 20 minutes and let cool down. Then run it again. The specs on the pumps are that they will or should empty a half full tank in about 20-30 minutes. I use the car's own pumps. Plug the load reduction relay in place of the fuel pump relay. Switch on the key and let the pumps pump. Watch the output into your catch can for signs of aeration which tells you the tank is essentially empty, switch off the key. Do not let the pumps run completely dry else they die soon after. Work in a well ventilated area away from heat sources and all other means of ignition. I hate reading: "But I bought this car for $500 and don't want to put another dime into it." The main pump is the cylinder under the car near the filter, not the pump under the seat, right? Where is the load reduction relay? Last edited by inlovewithavdubengine; 07-03-2014 at 12:09 AM. The main pump is on the passenger side of the car, in front of the rear axle. The Load Reduction Relay should be in the fuse box bottom row second relay from the left. 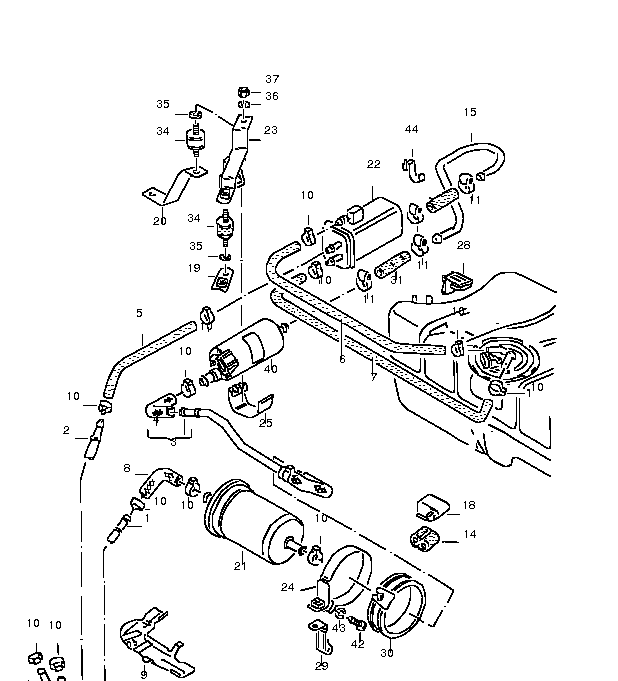 The Fuel Pump Relay is in the second row from the bottom second relay from the left. Chrysler in the 90's started to place a gas tank siphon hose off the sending unit under the tank. Made it a tad easier to change the pump. These guys are nuts, risking YOUR $100 main pump. However, that is just how you TEST the fuel pump flow rate Bentley manual has a graph and everything. Just use the transfer pump in the fuel tank, assuming the hose supporting it is good. One of the fittings is gas in, one is gas out. AFTER disconnecting one wire from the main pump, just connect a hose from 'gas out' to a large gas can, and do as above - jumper that relay. Then, yes use a siphon deal. I use a 100% plastic squeeze bulb deal, works great if can reach the gas. Watch out for gasoline hidden on the other side of the hump for the rear beam. Last edited by MacGruber; 07-03-2014 at 08:31 PM. More like, fireball waiting to happen; and it's not like fuel tanks are regularly drained like oil pans are. It's bad enough these fuel tanks develop cracks and leak. If you don't want to use the fuel pump(s), go to Harbor Freight and get one of these: http://www.harborfreight.com/http-ww...3290-html.html . Last edited by kamzcab86; 07-03-2014 at 10:13 PM. Really? You think so even with the cautions posted? ......Watch the output into your catch can for signs of aeration which tells you the tank is essentially empty, switch off the key. That made me laugh. Apparently he needs a few more cautions. First I am not a nut. Second, the main pump costs well over 100 dollars. Facts are the bane of the misinformed. As they pump out @ 40GPH. (even the transfer pump flow @ that amount). So in about 8.6 minutes your pumps are going to empty 13 gallons of fuel, 40GPH/60 .6666666 GPM, .66666666*13 (assuming a full tank) 8.6 minutes. You aren't going to Burn up your pumps, any more than if you drove your car. Fuel pumps use fuel in 2 ways, to lubricate the pump, and to cool it. Caveats: once you start to pump air, shut it down. Ron, and I aren't going to tell you crap that will ruin your car. I admit - I overlooked the obvious too - he has 6 year old gas in the tank, so don't pump it through the main pump, and the fuel filter, and the fuel pressure valve right back to the return line. Bosch pump price as assumed to be new - even worse to run 6 year old gas through a new pump. The Transfer Pump will spew gas at a ridiculous rate, as long as the pressure is very low, pumping at a good clip to supply even a CIS main pump. The very same transfer pump is used on my car so I know. Last edited by MacGruber; 07-06-2014 at 10:19 PM. DigiFant ain't got no fuel distributor. Thanks for all of the warnings, folks. Safety first. I moved my hookah, tiki torches, and hibachi to the backyard for now. I connected some spare hose & bucket to the business end of the main pump and turned the key. Pumps out a few ounces at a time and only when the starter is trying to turn over the engine. Yeah, that would just be too easy. Later, I went to the hardware store but at the last minute decided to be a cheapskate and not to get the $6 tool. I tried siphoning it the old fashioned way. I inhaled fumes until I got lightheaded but didn't get a drop of fuel out. Back to the drawing board. This is becoming kind of a pain in the arse. Might just end up getting the tool. Last edited by inlovewithavdubengine; 07-06-2014 at 09:35 PM. .......Plug the load reduction relay in place of the fuel pump relay. .... and vice versa? Just for clarity. Not really, no. No need. Wouldn't work anyway. When you pull the load reduction relay from it's usual location, the wipers, HVAC and rear defog won't work, you won't be needing any of those while you pump the tank empty. I did as y'all said, and plugged the Load Reduction Relay into the Fuel Pump Relay with left the load reduction slot empty. Snaked my spare hose from the fuel line (just before the filter inlet) into a large plastic jug. Turned the ignition key to the "ACC" position. It worked like a charm; the pumps did their job and I started seeing foam within 2 minutes. I'd say there was only a few gallons in there any how, but those few gallons needed to go. Looked about bone dry and relatively clean when I peeked into the tank through the transfer pump panel underneath the back seat. Mission accomplished, ladies and gentlemen. Lord almighty, they weren't kidding when they said this stuff goes south after a few years. Visually, the difference between the new gas and the old is like comparing a crystal clear Pinot Grigio with the urine of a very dehydrated cow. Anointed the gas tank with several liters of brand new unleaded. Turned the key, and after 3 or 4 tries she roared to life. I revved it a bit and let it idle for a little under a minute just to hear the purr and then I cut the power because the alternator and water pump belts haven't been installed yet. Things are definitely looking up. You must be joking after the supposed 'experts' told you to pump brine through your precious main pump. The transfer pump, with no back pressure, will pump at upwards of 60 gal/hour all by itself, and since you have to disconnect it anyways to siphon the remaining brackish gas, you may as well just hook a hose to the outlet fitting. First however, the main pump must be disabled, and gaining access to one electrical terminal could be a PIA. They should be inspected anyways, as it is common for corroded terminals to lead to a voltage drop, causing the pump to strain at the lower voltage. Last edited by MacGruber; 07-16-2014 at 08:58 PM. I am kinda confused. Isn't the old in time solution to just siphon the gas out? Without any pump in takes about 12 minutes to drain a full tank and there is no danger to any damage. If you have a drill pump, it takes 3-4 minutes. Have you ever read the Bentley? Oh he has the Cliff Notes version, Chiltons. Bad gas isn't Brine, if you had ever gone to sea, and see what Brine is and what it can do, you wouldn't generalize. Thinned Varnish would of been more accurate.